The promotional nights will take place in both Cleveland and Rochester. 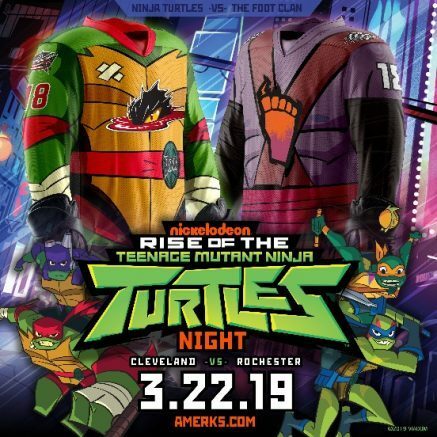 The Rochester Americans, in conjunction with the AHL’s Cleveland Monsters, announced a special two-game home-and-home series of Nickelodeon Nights featuring the Teenage Mutant Ninja Turtles. The North Division rivals will wear the same themed jerseys again on Friday, March 22 when the Amerks host the Monsters at The Blue Cross Arena. Be the first to comment on "Amerks, Monsters announce details for home-and-home Nickelodeon series"